Emblem of Katibat Dir’ al-Watan. On top: Dir’ al-Watan. On bottom: “The Special Force.” Note the Russian and Syrian flags in the emblem’s centre. Note also the cedar of Lebanon on the bottom of the emblem. When the Fifth Legion (V Corps) was announced in November 2016, it was debatable how far this new formation would emerge as a real fighting force. Indeed, recruitment efforts in Latakia province and apparent annoyance at the constant messages urging people to sign up gave a hint that the initiative was floundering. However, subsequent developments have shown that the Fifth Legion is indeed a serious formation, becoming a fighting force on multiple fronts like Palmyra and the north Hama countryside. Moreover, the suggestions of the Fifth Legion as a formation intended to bring together personnel from different groups have also been borne out. For example, Kata’ib al-Ba’ath (The Ba’ath Battalions), one of the larger and older auxiliary forces for the regime, has worked with the Fifth Legion to set up Liwa al-Ba’ath (The Ba’ath Brigade). Katibat Dir’ al-Watan (The Homeland Shield Battalion), the subject of this piece, is the latest Fifth Legion sub-unit to be created. “The peoples of the border villages of the Beqaa have taken on their shoulders the protection of their security from the takfiri expansion. This area, of tribal nature, present on the shoulder of Syrian Qusayr, constituted in 2013 the tributary for the advance of Hezbollah from the Lebanese side in the operation through which the armed groups were removed from the borders of Lebanon. After four years, the area is being penetrated again from its wide doors. According to estimates, 30,000 Lebanese live in 12 Syrian villages on the borders of Lebanon. The difference is that these people are Lebanese citizens who have fulfilled their obligations [of citizenship] and have chosen to live on the Syrian side as there are no geographic barriers separating the two sides, but rather it is a natural extension for the families and tribes of the Hermel. In the beginning of the events, these families and tribes were able through coordinating with Hezbollah and the Syrian and Lebanese armies to protect these villages through youth sharpened to raise arms, making their villages logistical rear bases securing the resistance’s back firstly, creating an aperture for it secondly, and eliminating the force of takfir thirdly. The role that the area played in the Qusayr battles, in addition to its adhesion to the Syrian depth that is located on the line of the armed presence as well as its geographic and family value, pushed those interested in the military matter to specify for it a real role. Hezbollah worked to incorporate dozens of youth under its banner, and likewise the Syrian army that designated for them a sideline role within the National Defence Forces played a role, in addition to groups that remained within the families but were supported by the concerned parties: the development has been such that with the Russian entry into the Syrian battleground, they have worked to connect the bridges, as the Russians understood the extent of the importance of this region on the Lebanese hip first and the hip of Homs second. A while ago, a senior Russian general visited the 12 villages that Lebanese dwell in, and he met Lebanese family and tribal groups, of whom the most prominent face was al-Hajj Muhammad Ja’afar, whose name has circulated widely in the past time from the understanding that he is one of the notables of the Hermel region and has wide links, and secondly from the understanding that his son is ‘Hadi’ who was killed at a checkpoint of the Lebanese army, and the revenge operation that followed from that. The visit, which occurred far removed from the media, revealed the existence of a Russian intention to work with the sons of the area, in accordance with Moscow’s plans in Syria. According to what the sources of ‘Lebanon Debate’ affirm, multiple meetings occurred, resulting in a general conception, military and developmental. ‘Lebanon Debate’ has learnt that through coordination, Russia has reached an agreement with the sons of the area, stipulating support for the establishment of a local military faction comprising civilians whose objective is to protect their areas first and aid in fighting the terrorist movemets second, and aiding the region developmentally speaking third. The direction has thus translated into an announcement in the past few days of the birth of a faction bearing the name Dir’ al-Watan. According to the sources of ‘Lebanon Debate’, the faction is composed of 400 Syrian and Lebanese fighters under the leadership of al-Hajj Muhammad Ja’afar, obtaining complete Russian support. 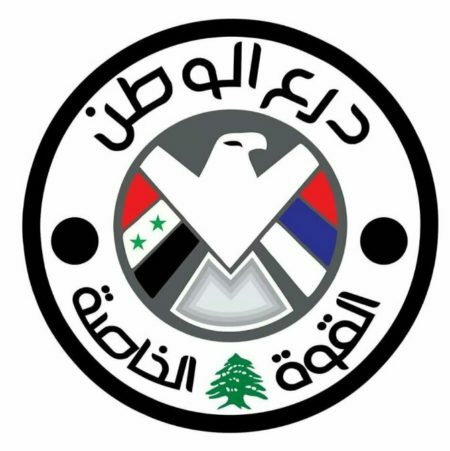 And this is confirmed by its emblem that uses the Russian flag alongside the Syrian flag and includes the Lebanese cedar as the link component between the two. Alongside the details of that Lebanon Debate article, it should also be pointed out that the Fifth Legion affiliation of Katibat Dir’ al-Watan provides additional confirmation of the Russian role in the creation of this new group. Russia is particularly invested in the Fifth Legion through provision of the latest military gear in a bid to make the Fifth Legion an effective force. So what are the implications of the creation of this new force? First, the renewed talk about hoping to split Russia somehow from the Assad regime in light of the fallout from the Khan Sheikhoun chemical attacks is divorced from reality. While there may be Russian annoyance with the regime for what has happened and past incidents in which the regime has managed to drag Russia into initiatives that some Russian officials may not have been so keen on, the Russian government remains heavily invested in the regime’s survival. The continued Russian efforts in bolstering existing forces and creating new units like this Katibat Dir’ al-Watan demonstrate that investment playing out on the ground. Second, it is wrong to presume that only Iran and Hezbollah are interested in Syria’s border areas with Lebanon as part of a supposed demographic change masterplan to clear out Sunnis and have a Sunni-free land route stretching all the way from Iran to Lebanon in order to create an uninterrupted Iranian-client Shi’i militia axis. In the case of the Qusayr-Hermel border areas (in which Hezbollah also maintains a heavy presence), Lebanese Shi’a in particular have inhabited the Syrian side of the borders since long before the Syrian civil war (see here also for a list of villages) with important familial and clan ties connecting the Qusayr-Hermel border areas. There are real concerns about security. In helping to set up Katibat Dir’ al-Watan, there is no doubt that the Russians, like Hezbollah, are playing on those concerns to build a client base. Thus, the Qusayr-Hermel border areas do not reflect a case study of the aforementioned demographic change masterplan. Rather, the case of the Qusayr-Hermel border areas shows that there are specific localised border areas that have their own dynamics that may be of interest to one or more of the regime’s foreign backers. Such cases may then lead to results of real demographic change on the ground, regardless of the original intentions. Other border areas, such as the Qalamoun towns like Nabk, Rankous and Yabroud as well as the areas near Mt. Hermon, reflect much more the workings of the regime’s own designs in those places: in these cases, creating viable local holding forces and auxiliary militia allies (thus Quwat Dir’ al-Qalamoun and Fawj al-Hermon respectively). Yet in Homs city, it is hard to argue that the Sunni-Alawite demographic shift that has occurred was not supported by the regime. As always, the need for nuance and detailed consideration is paramount. Don’t miss Bashar Assad telling the world his expected Big Lie about no chemical attacks. His face is greyer, his ears pointier and he definitely does not have any top teeth. Young Aymenn Jawad Al-Tamimi produces floods of enthusiastic write-ups about transient self-styled militia groups. But never the main militia story. The only one that matters. Quote: Bashar Assad’s power over the areas of Syria under government control is slipping. Armed militias are growing stronger and the country’s president can do nothing to stop them. The story describes blatant unchecked looting and thugs pushing people out of homes and businesses. It points out that if the warlords become more powerful, Assad may soon become little more than a figurehead, surrounded by a coterie of robbers and smugglers. And the militias are also gaining political influence: In ‘parliamentary elections’ last spring, candidates from the old ruling class didn’t do as well as they had in the past. Instead, candidates affiliated with the warlords emerged victorious. Comment: The abovementioned warlords would include a number sponsored by Iran, which has rapidly expanded its land and property grab in Syria. Postscript to my comment #1 above. Computer imaging analysis would prove it. The more ridiculous and desperate the lies, the more Bashar Assad’s head shrinks and the more his eyes sink back in his strange undersized face. Trump calls him ‘an animal’, but he’s a much weirder and more sinister sight than anything seen in the natural world. I do not know how anybody can praise the regime or the rebels. Syrians were left to choose between Nusra and Assad, the promise of a free and democratic Syria is an illusion but people have the right to dream. According to Bush democracy will reach the Middle East !! I feel like much of the disagreements between Syrians is centered around which is worse for Syria, Nusra and its allies or Assad and his allies, what a sad fate for a country that gave so much to humanity and had a lot of potential. We have been saying this for long time. Bashar is an animal . Finally, it is coming from the prez of our country . I add Nasrallah is an animal and the mallalis of Iran are too including their chief mullah.